Dunes are arguably one of the simplest geologic systems there is—piles of sand blown around by wind—and they abound in the solar system. As such, they offer a unique opportunity to test our understanding of how simple sedimentary processes are affected by different environmental conditions. Until recently, however, the study of extraterrestrial dunes was restricted to orbiter-based imagery and few martian ripple fields observed close-up by the Mars Exploration Rovers, Spirit and Opportunity. Between November 2015 and April 2017, the Mars Science Laboratory (MSL) Curiosity rover traversed, for the first time in humankind, an active dune field on another planet—the Bagnold Dunes of Gale crater. Curiosity’s scientific campaign at the dunes was organized in two phases. Phase 1 occurred near the northern, trailing edge of the dune field during the low-wind season (southern fall/winter), while Phase 2 occurred near the southern edge of the dune field during the high-wind season (southern summer). During Phase 1 (November 2015-February 2016), Curiosity investigated two crescent-shaped dunes (or barchans), Namib Dune and High Dune. A broad range of scientific questions related to wind processes was addressed using the rover’s suite of instruments (Bridges and Ehlmann, 2018) through an extensive campaign spanning wind measurements, detailed observations of sand grains, ripples, and dunes, and a characterization of physical properties as well as the chemical and mineral composition of windblown materials. Results from Phase 1 were presented in a special issue of JGR: Planets (see also corresponding Editors’ Vox by Ehlmann and Rogers). However, because Phase 1 took place during the low-wind season, several questions related to the dynamics of the dunes remained unanswered. Furthermore, sampling windblown sands in a single location did not permit the characterization of possible spatial variations in composition. 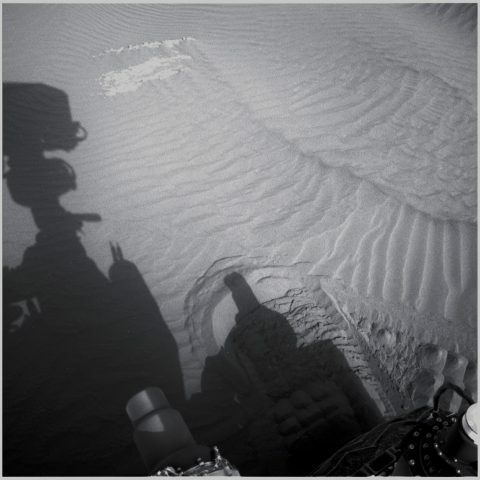 The MSL Science Team thus decided to extend the scientific investigation of the dunes to include a second phase further along the rover traverse during the windy season (Lapotre and Rampe, 2018). Phase 2 (February–April 2017) took place near a linear dune, the Nathan Bridges Dune, and a ripple field, Mount Desert Island. In contrast to the barchan dunes investigated during Phase 1, the Nathan Bridges Dune, named by the team in honor of our dearly missed friend and eolian expert Nathan Bridges, is longitudinal to oblique, i.e., its crest is roughly parallel to the average wind direction. Curiosity also inspected a few isolated ripples and ripple fields on its way to higher stratigraphic levels on the crater’s central mound. The results of the second phase investigations are presented within a new special collection of Geophysical Research Letters. The findings presented in the special collection encompass a broad array of questions that remained unanswered after Phase 1 and integrate across observations made throughout the entire campaign. Some of the key results are described below. Weitz et al. present a characterization of grain sizes and shapes within and outside of the active dune field. Although sand is dust free and narrowly distributed within the active portion of the dune field (with a median grain size ~100-150 µm), isolated ripples and ripples in ripple fields south of the Bagnold Dunes have coarser crests (typically ~300-500 µm and up to >1 mm) and some are covered by a thin veneer of dust. The paper by Lapotre et al. described the observation of a rich diversity in bedform morphology and dynamics. Specifically, large (meter-scale wavelength) ripples that are alien to Earth’s sandy deserts but are ubiquitous on Mars are found to not only form transversely (like those seen during Phase 1) but also longitudinally or obliquely to the average wind direction. Baker et al. made estimates of sand fluxes during the windy season based on direct observations of the migration of small, decimeter-scale impact ripples by up to a few centimeters per martian day (or sol). O’Connell-Cooper et al. present in situ measurements of the geochemical composition of windblown materials, including sand and dust. The coarser fractions show enrichments in Fe, Mg, Ni, and Mn, consistent with an enrichment of mafic minerals in coarser grains, an enrichment in felsic components in finer sand, and a depletion of S, Cl, and Zn across all sand sizes. Gabriel et al. show that active sands are also shown to contain very low H relative to other soil targets within Gale crater. In contrast, the paper by Lasue et al. shows that fine dust is found to be enriched in S and Cl. In addition, Stern et al. characterized the volatile content of windblown sands, and found that the Bagnold Dunes contain more oxychlorine, carbon, and nitrate than other soils of Gale crater, but less adsorbed water than dusty soils. The papers by Johnson et al. and Rampe et al. present remote and in situ measurements of mineral composition of actively transported sand. 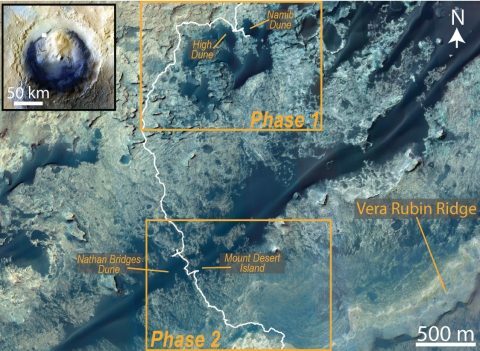 Combined with observations made during Phase 1, these measurements indicate an overall basaltic composition with subtle spatial variations in composition with position on individual bedforms and across the dune field. These variations likely reflect wind-driven sorting of sand by grain size and composition, and the possible incorporation of materials derived from local bedrock. Finally, Miller et al.,  explore in situ constraints on the influence that sand dunes have on local, high-frequency temperature fluctuations. Altogether, observations made by Curiosity at the Bagnold Dunes further our understanding of modern martian eolian processes at scales that are unachievable by current orbiting cameras and spectrometers. They also help to refine the sedimentological and geochemical models used to interpret ancient rocks on other planets. —Mathieu G. A. Lapotre (email: [email protected]), Harvard University, Cambridge, Mass. Citation: Lapotre, M. G. A. (2018), Seeing Mars in a grain of sand , Eos, 99, https://doi.org/10.1029/2018EO106925. Published on 17 October 2018.